Put together a few grown-up friends with a flair for flavor exploration during a sizzling hot summer and you have a recipe for mischief-making in the kitchen. That’s how “Vice Pops” were born. 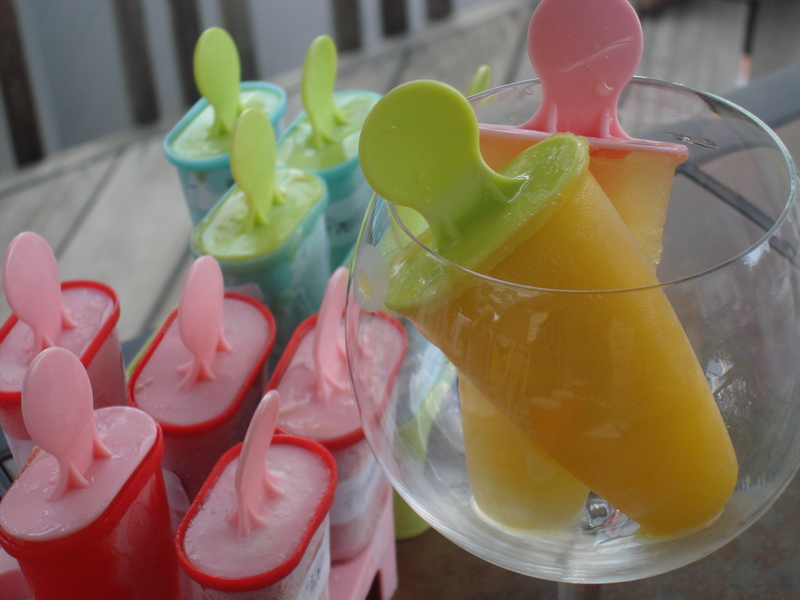 What could be cooler than an ice pop or more relaxing than a summer cocktail? And what could make more sense than putting them together in one handy frozen lolly? This experiment came with its challenges. Too much booze and the pops won’t freeze. Too little and…well, what’s the point? Ashley, Maryanne and I put our heads, taste buds and (pathetic) math skills together to figure out the right flavors and proportions. We also had to strategize. 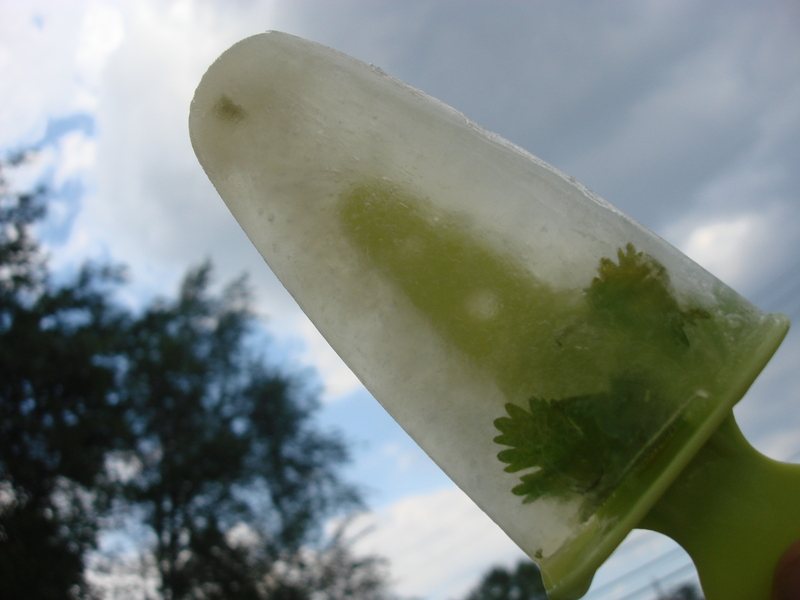 It takes up to eight hours for alcohol-laced pops to freeze. When would we test drive them? We sorted it out and took advantage of a get-together with friends two days later to get feedback. And the feedback was terrific. “The espresso pop gets three thumbs up,” said Cara. It also had to be consumed the most quickly; it didn’t freeze hard and has great potential as a slushy. The cilantro mojito reminded Jainy of cilantro water drunk in India to keep cool. It was probably my favorite, as I like tart much more than sweet and I think they are the coolest looking. The orange mango (which had the least alcohol) froze the most solidly. Me being me, I’d add a dash of lemon or bitters the next time for more complexity. And we all liked the passion fruit; nothing could be more tropical. We did notice that for some reason the alcohol in the passion pops really concentrated on the bottom. And…if you like piña coladas and getting caught in the rain…. (had to do it, sorry), you will really like the coco loco! 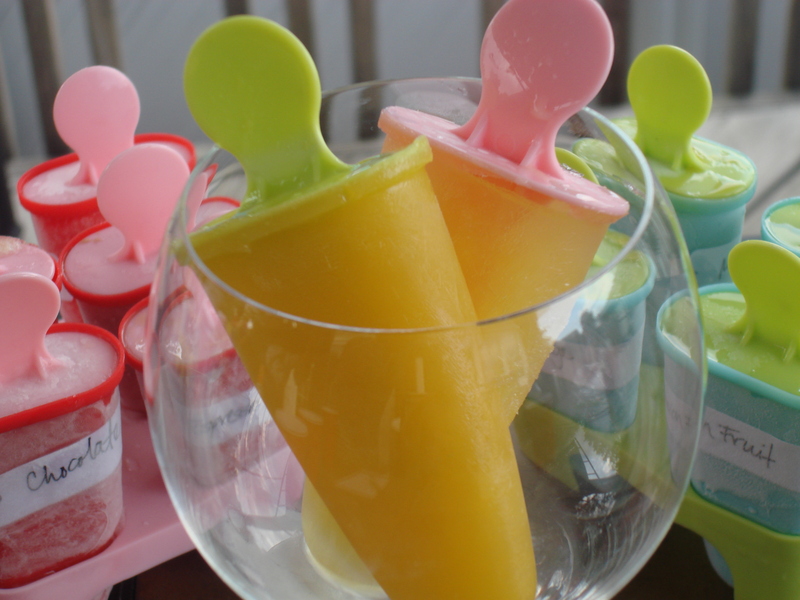 You will see that the basic proportions for freezing are 1.5 cups of juice to 5 Tbs alcohol (except for the mango-orange). So there really isn’t a lot of alcohol in there; just enough to take the edge off, as it were. I hope to have time to try some more variations; once my mint grows back from the scalping I gave it recently, mojitos will be on the frozen menu. That brings caipirinhas to mind as well. I am also interested in how berry syrups will work. Oh yum. Gotta try these. Of course, I’d add the classic mojito with mint too. I think it will, if you respect the proportions of alcohol to liquid…Let’s try it! How about Poco Coco or Poco Roco (playing on the Pineapple and Rum)? Now I know why the espresso pop was so creamy–the milk!